She’s sticking needles in her skin. I turn with an ugly grin. Her canvas doesn’t leave a lot… to fantasy. But her peace of mind can’t stay in inside the lines. It’s so… confusing, the methods that she’s using. She knows she shouldn’t leave a mark… that I can see. Lost inside her dirty world, no one hurts this pretty girl but her. I guess there’s nothing left to do, but have my way. She can feel it’s right so she doesn’t close her eyes. She smiles and answers- it doesn’t seem to matter. Lost inside my dirty head, something tells me I’m the one who’s kept. Oh, I need the pain. Please tell me she won’t change…. We were meant to be together. Now die and fuc*** love me. We were meant to hurt each other. Now die and fuc*** love me. Die and fuc*** love me. 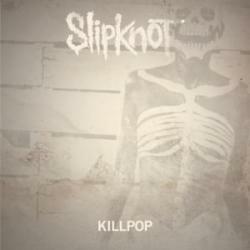 KILLPOP es una canción de Slipknot del año 2014. La letra ha sido escrita por COREY TAYLOR, JAMES ROOT; publicada por Sony/ATV Music Publishing LLC. Agradecemos a Ratita2 por haber subido la letra.